Deangate Residential Care Home, Barnsley was constructed in 1990 and, unlike typical care homes converted from residential property, it is a purpose built detached home with pleasant grounds to explore. Conveniently situated within the village of Mapplewell on the outskirts of Barnsley, Deangate provides easy access to amenities including the village hall and local library. The local bus service runs every ten minutes providing great access for visitors. 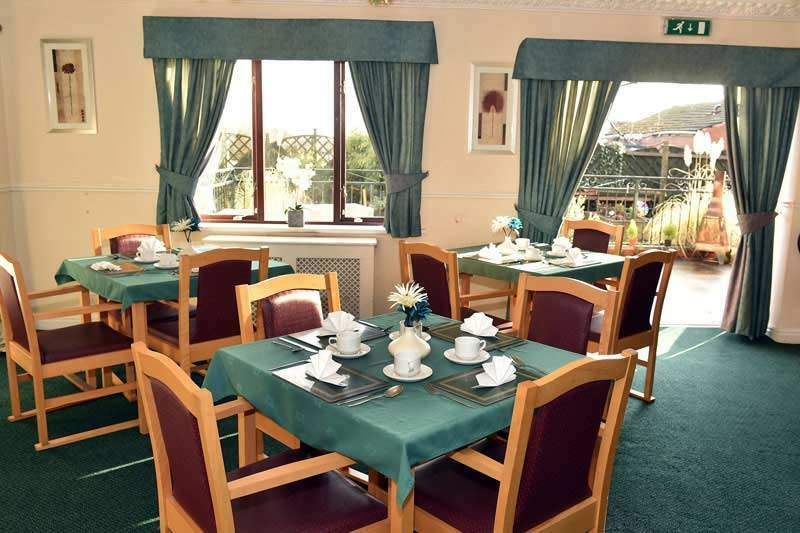 In the county of South Yorkshire, Deangate Residential Care Home Mapplewell, Barnsley, houses 47 bedrooms, 44 of which have en-suite facilities. The rooms without en-suite facilities do have wash basins for residents. 3 of our rooms are shared/double rooms, for any couples or residents who just prefer to share rooms. Our rooms are decorated to an extremely high standard, whilst also allowing for residents and family members to add their own personal touches to create that ‘Home from Home’ feel. We have phone and TV aerial sockets in all rooms as well as internet access for our residents to take full advantage. Wheelchair accessibility means all our residents can access any and all of our rooms in the home. All of our residents are encouraged to keep their own GP where possible, ensuring that our residents feel they have control over their own health. Pets are welcome at Deangate Residential Care Home Barnsley, by arrangement, making the transition into care easier for our residents as they can have a friend beside them along the way. We also have a small shop and a car park to be used by our residents and visitors as well as daily newspaper deliveries and orders for residents. An ample sized spacious dining room provides a great social point for meals. Fresh food, cooked daily by our onsite cooking staff offers a fantastic choice of nutritious and appetising meals and any specific unique dietary and cultural requirements can be easily catered for. Deangate Care Home Mapplewell can also cater for any and all celebrations its residents wish to rejoice in. Friends and family are welcome to join our residents at meal times, giving everyone a chance to catch up over our choice of 2 meals. Residents never have to eat with everyone, we always give the option for residents to have their meals within the comfort of their own rooms. We also have snacks, fresh fruit and refreshments available for our residents constantly, ensuring everyone is always nourished in between meals. Our four lounges give plenty of space to enjoy catching up in a quieter area with your relative or friend. We also have a relatives and a TV room for residents to kick back and unwind in with the company of other residents. Deangate Care Home in Barnsley, South Yorkshire boasts its own hair salon and tea room in which our relatives can be pampered until their heart’s content or sit and enjoy a cuppa with their friends, family or other residents. Our kitchenette is free to use by our residents and any of their visitors. Our landscaped garden includes raised a flower bed and comfortable seating areas for our residents to bask in come the summer months. Wheelchair access means that everyone can enjoy our luscious garden. Deangate Care Home in South Yorkshire also has a secure patio area so residents can enjoy the scenic views of its outdoors without having to get cold on winter days. As in all of our homes, a dedicated activities manager is on hand to ensure that all of our residents have the opportunity to stay active and enjoy hobbies they previously took part in.